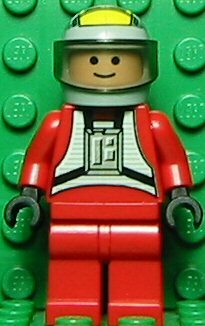 The B-Wing Pilot is a minifigure first released in 2000. It represents the Rebel pilots in Star Wars who specialised in flying B-Wing fighters. There are three types of B-Wing pilots. The first two both wear red suits and the same type of helmet, however the head of the pilot included with 7180 B-Wing at Rebel Control Center is yellow, while the head of the pilot included in 6208 B-Wing Fighter is flesh-coloured. The B-Wing Pilots were Rebel Pilots who flew B-Wings, which were first introduced in Star Wars Episode VI: Return of the Jedi. This page was last edited on 14 August 2016, at 03:27.